Thank you guys so much for all of your opinions and advice on my post on Tuesday! Fashion is obviously NOT my strong suit, and it’s nice to hear what y’all think of different pieces on me from an outsider’s perspective. I’ve decided that for every piece of clothing I add to my closet, I want to ask myself how it makes me feel. Does it make me happy? Then it has a chance. Otherwise, nope. I don’t need to add more “meh” items to my repertoire just because they’re the right price point or because I feel obligated or because they almost fit the bill of something I want in my closet. When I looked at the items this way, the grey sweater with lace that hit me at an odd spot and the tent-shaped maternity looking silky shirt both got returned no questions asked. Really not my style, didn’t fit awesome, and just not worth it, especially with the mostly negative feed back from you guys as well! That brings me to the final three items in this month’s box. The striped shirt FELT so damn good when I put it on. I really did like it & liked the colors in it, but the cut of it / pattern on it didn’t really do me any favors. I liked it, and if I already owned it I would wear it, but it didn’t seem worth $48 for a shirt that didn’t make me feel awesome in it. Returned. And that brings us to the scarf. I loved the color from the moment I saw it, it will go well with existing pieces in my wardrobe, and if I wasn’t going to get anything else from my box, I felt good about spending an additional $8 to get this scarf (since the $20 stylist fee applies towards any purchases you make). Sold! Thanks again for all of the help & feedback – that was fun to hear from everyone! **I also get a $25 credit if you sign up for a Stitch Fix box through my link. Signing up does NOT mean you have to schedule a box right away. You can look around and get a feel for it. If you do ship a box, then I get a credit, and if you refer anyone, the same applies to you! He actually HAS noticed and complimented me on the new pieces. Honestly, in the 10 years we’ve been together, I’ve spent VERY little on clothing (nothing compared to him for sure! ), so this is new for me (and doesn’t bother him at all), PLUS, I I’ve still only spent $159 over 3 months on this (that has paid for 2 scarves, 2 nice shirts, 1 necklace, and 3 styling fees). I won’t continue to buy stuff every month forever, but it’s kind of fun to get a few new things now that I’m coming out of the fog of 4 years of pregnancy & nursing and having to wear clothes that accommodated that! I love the scarf. It’s a great color and looks great on you. 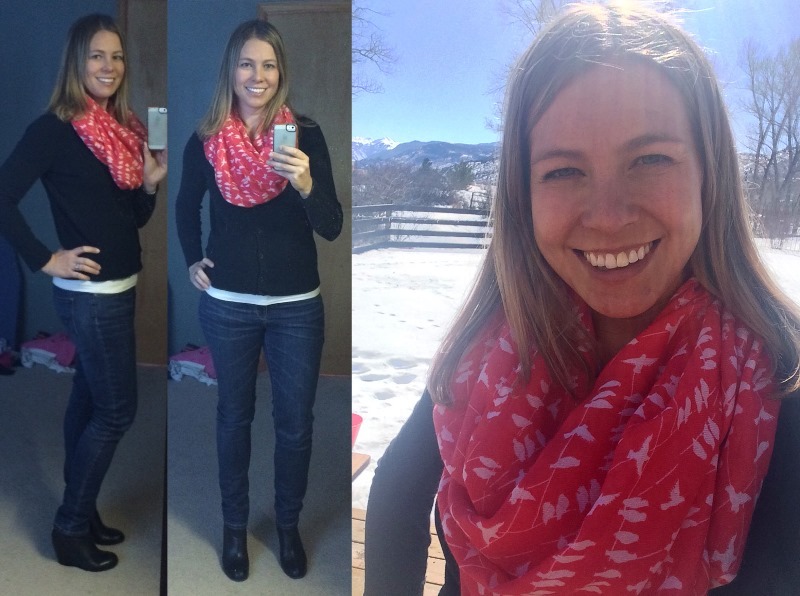 I’m kind of obsessed with scarves–they’re easy and add just enough color to any outfit. And I’m sure people tell you this all the time, but you have the best smile! I absolutely ADORE that scarf – fabulous color and I really like the motif. Perfect for spring. And I am really obsessed with scarves. Also, I never got around to commenting on the first post, but a good decision to return the shirts. I really loved the blue shirt with the hearts and I LIVE in shirts like that these days, but I agree that it wasn’t flattering on you. Finally, do you have an H&M near you at all? I’m guessing not, but maybe you could stop in when you’re in Denver soon? I LOVE a line of jeans they have called, I think, “Super stretch skinny jeans.” I have them in grey, black, and dark wash and wear them ALL the time. (They also have some patterns and in the spring/summer they usually also have bright colors like green and red.) They tend to be folded on a table as opposed to hanging somewhere. And they’re cheap – like around 20€, so I’m guessing somewhere in the $20-30 range. I know you want quality stuff, but honestly these are awesome (and always too long on me…). Closest H&M is Denver (before that it was STL or MSP I think? ), but that’s a good idea to visit there next time I’m up there. I LOVED shopping there when I lived in France. Love the scarf! And now you’ve turned me onto ThredUp. That’s an awesome site! Yeah, like new stuff, but for WAY cheaper. It’s awesome!